It has been two years now since I left my work in congregational ministry— which means that for the past two years I have been able to consistently worship with my family instead of sitting in the “pastor’s” seat in the sanctuary. We have gotten into a particular habit lately, where my son sits in between my husband and I in the historic and weathered pews of our small congregation. Frequently during worship I will feel my son grab my hand and wrap my arm around his shoulders. He is still about a head shorter than me, so often during the standing portions of the service he will slip in front of me with his back resting on my front so we can share a bulletin. Regularly he needs a simple reminder in the form of a firm squeeze on his knee to help him be still so as to not distract the kind people who worship behind us every week. I have not gotten too caught up in the attachment parenting pros and cons as a variety of people debate the benefits of baby-wearing, bed-sharing and other attachment practices. 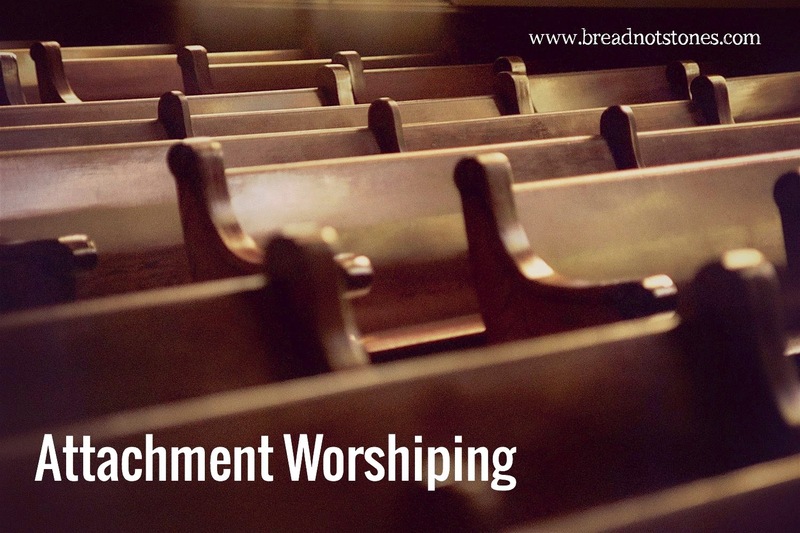 But what I am is a huge proponent of attachment worshiping with our children: doing what we can to make them feel safe and comfortable in that space; reaching out to them to make worship not just about a singular interaction between the individual and God, but something that we do as a community and as a family that connects us with one another; acknowledging that learning to be still and attentive in worship can be hard for some children (especially mine) and connecting with them physically in that space recognizes the ways their bodies yearn to move and wiggle. We tend to think of the most sacred places in our sanctuaries as behind the pulpit, table and font or even beneath the cross, but the pew is just as holy. The space between us and among us in the pew is sacred as well. It is inevitable that we form connections and attachments with those next to whom we sit in worship. I remember, when my husband and I first started dating while in seminary, how important it became (for me at least) that we sit together in community worship. While saving a seat for my “boyfriend” in worship might have come off as juvenile, there was something tangible and formative for our relationship in sharing that sacred space in worship together week after week. As an associate pastor, I often sat in the front pew of the sanctuary next to our music director. Week in and week out we shared that sacred space together. While we were obviously part of a team of ministry staff, she and I became worship partners and sisters in faith because of the time we shared that sacred space together. Included in that sanctuary, in the back, was a formidable row of widows who had made sure to worship with each other for years. While we would chuckle about their inflexibility toward moving around to other places in the sanctuary, I believe there was something holy in their commitment to share that space with each other every week. Even the Bible recognizes the bonds that are formed when we worship together. In Psalm 55, the psalmist laments a betrayal at the hand of a friend - a close companion, an equal - with whom he had worshiped. This connection had been so strong, which made the betrayal so much harder to endure. I remember vividly from my youth when I stopped sitting with my parents in worship and began to sit with my friends instead. It was an important moment in developing my autonomy as a “worshipper,” but also in strengthening my connection to my friends who were on this same awkward spiritual journey with me. A few years ago, when the high school students in the congregation I served were looking for ways to be better connected to each other, I suggested that they try sitting together in worship for a while to see how that changed their relationships as members not just of the youth group but also of the congregation. It was fascinating to watch how their relationships changed through that experiment. It was also great to watch the congregation’s positive reaction to their very public expression of friendship and connection. We often lament how rigid people become about “their” pew and their inflexibility in the face of change. I choose, in some moments, to give these people the benefit of the doubt and to believe that their commitment to their regular seat in worship isn’t just about an aversion to change, but a recognition of the attachment that they have formed with those who share that space around them -some of them for years. So if this space is so holy and so vital to our relationships with significant others, with our colleagues, with our friends, with our community of faith, how much more important is it to our relationships with our children? Worshiping together in this season of our lives as a family is about welcoming my own child into that sacred seat next to me in the pew, rather than resenting him or feeling like he has invaded my personal space. In this space, I hold his hands between mine to warm them up when the air conditioners are turned up too high in the summer. In this space, he puts his head on my lap when he is feeling sick or tired. In this space, he snuggles up to me for comfort when he catches a glimmer of understanding when a sad prayer concern or sorrow has been shared by the community. In this space, we wrap our arms around each other during prayer to help him endure an extended period of standing that his wiggly legs rebel against. In this space we whisper in each other’s ears - sometimes questions, sometimes jokes, sometimes complaints, sometimes instructions. This is holy ground. This is the mercy seat. This is a place of honor. This antique and worn out pew, where generations have sat before us, is just as important as any classroom or cozy chair, any dining table or bedtime ritual that we will share. The day will come too soon when I am back in that pulpit chair or he has started asking to sit with his friends in worship. But until then, I will fiercely guard this sacred space that we share and the sharing and attachment that happens within it. Our church is on a university campus, has grown from a student chapel to a "real" church. It is so great to see our group of students sitting together every Sunday, a witness to the rest of us and I'm sure a support to each other. Keep it up, SOUL (Students of University Lutheran)! Rebecca, This is so beautifully articulated and a real testament to intergenerational worship as well. May I please repost on our Kids Friendly blog? Thank you for sharing such beautiful insights. Kaila, so good to hear from you. Please feel free to repost. Hope you are well. I found this piece again after reading your latest blog post. It speaks to a writing that I had recently published on The Mudroom blog. There is something beautiful that happens amidst church buildings and people when we remember and give thanks for the space and the people we encounter. Thank you for your words and faith and inspiration. I am sure this article has touched all the internet users, its really really good post on building up new webpage. It's great enormous impressive wonderful fantastic that you are getting ideas thoughts from this article post piece of writing paragraph as well as from our discussion argument dialogue made here at this place at this time .